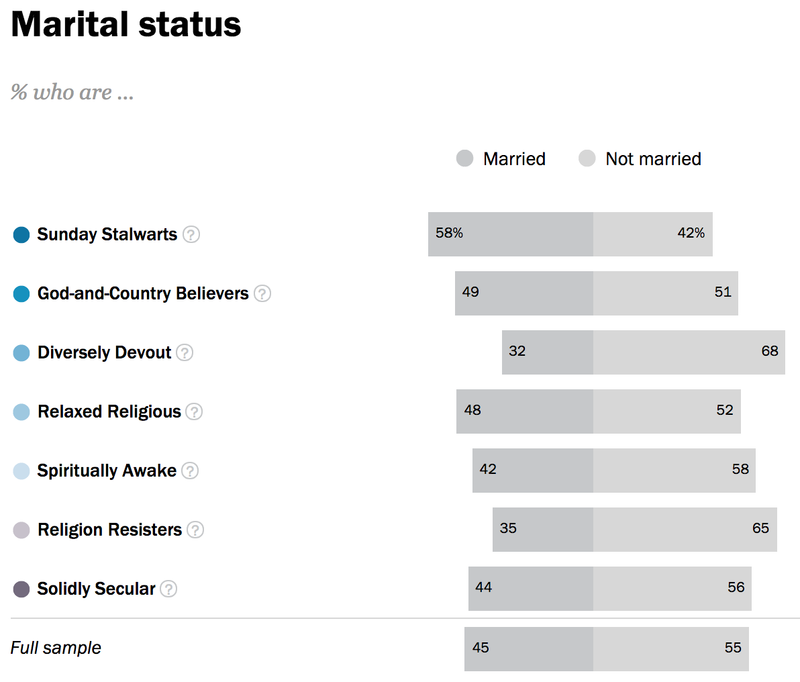 The Demographics of How “Godly” Are Our Religious Beliefs? What are the seven types or groups? And how many are in each group? 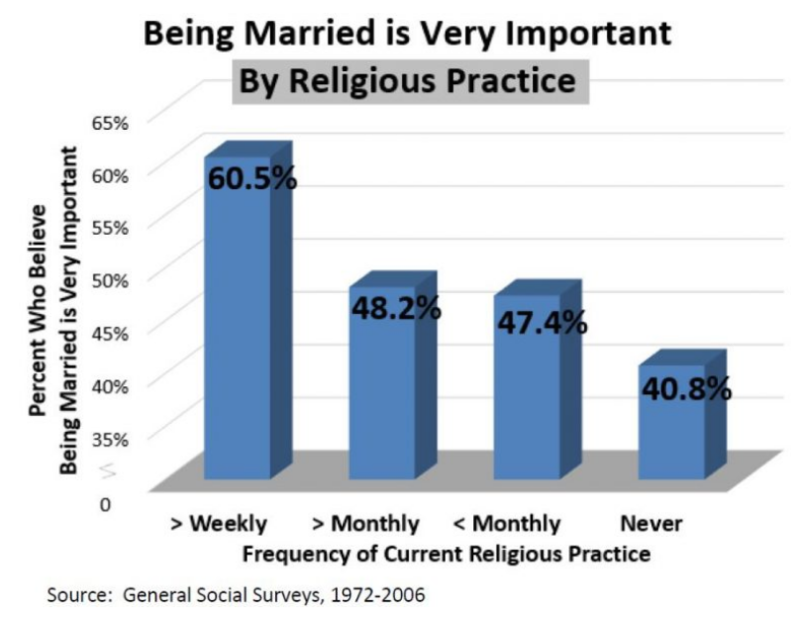 The chart above gives some idea of the link between frequency of religious practice and the importance given to marriage. I note this as a reference point to keep in mind as you study the details below. What is the relationship between Pew’s seven types and the typical identification by denomination? 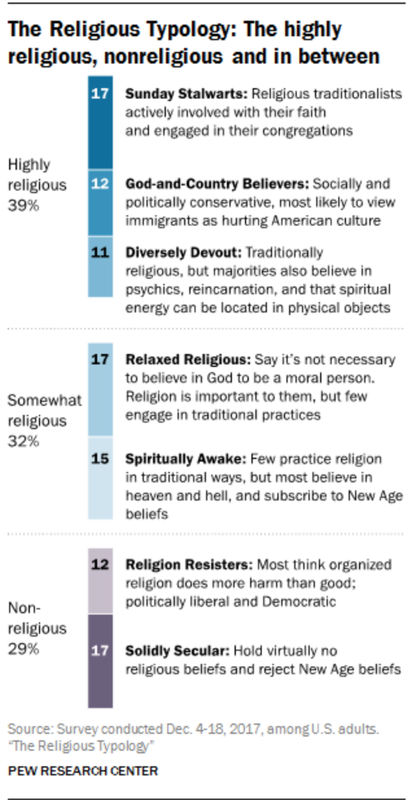 As I am Roman Catholic, naturally, I paid attention to how represented Roman Catholics are “Sunday Stalwarts” (13%). 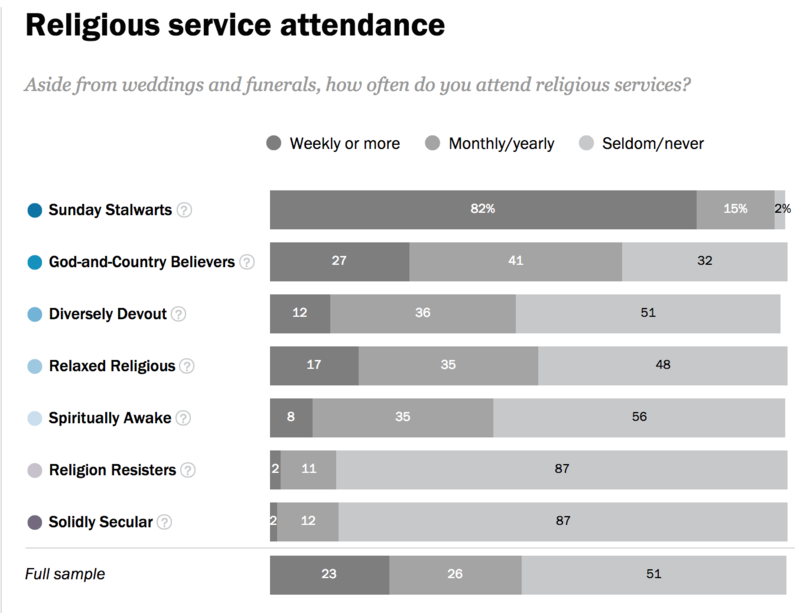 [By the way it is very easy to misread this chart: it is not the percent of Roman Catholics who are Sunday Stalwarts but the percent of Sunday Stalwarts who are Roman Catholic). But still, for Catholics it is a poor showing indeed, for a religion which puts so much emphasis on the Mass (as the act of Redemption, and the obligation of weekly worship of God by this means). Compared to Evangelicals they are weak in worship, even if, by the nature of being an Evangelical, one self-selects into a devout group, whereas being Catholic has (in ordinary life) as much to so with what one was born into as it has to what you intend do about it. The biggest showing for “Catholics” is among the Diversely Devout — a strange title for you if you are “Catholic” because devout usually means a high level of faithfulness but not in this case! However, for the Pew typology the Diversely part fits it fits by Catholic norms even as the Devout part fits by Pew Typology norms. 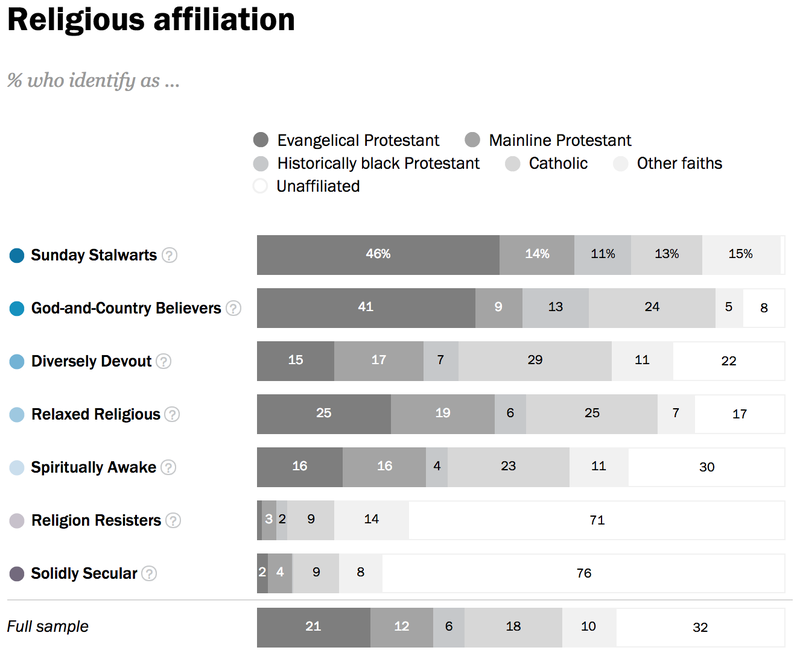 But Pew acknowledges the shortcomings of its “clustering” techniques. Even given my concerns the data is very helpful. What is the relationship between the seven types and family behaviors? What is the relationship between marriage and the seven types? Given that the next chart does not control for age it is not all that helpful. The biggest issue in “marriage” is the intactness of the biological parents’ marriage between their mid-30’s and their early 50’s, that phase of family life when their marriage has the greatest influence on their children’s future. From the Pew data below, we cannot tell. It would be nice to figure out where the 7 types tend to fall in the different strata of family structures below. 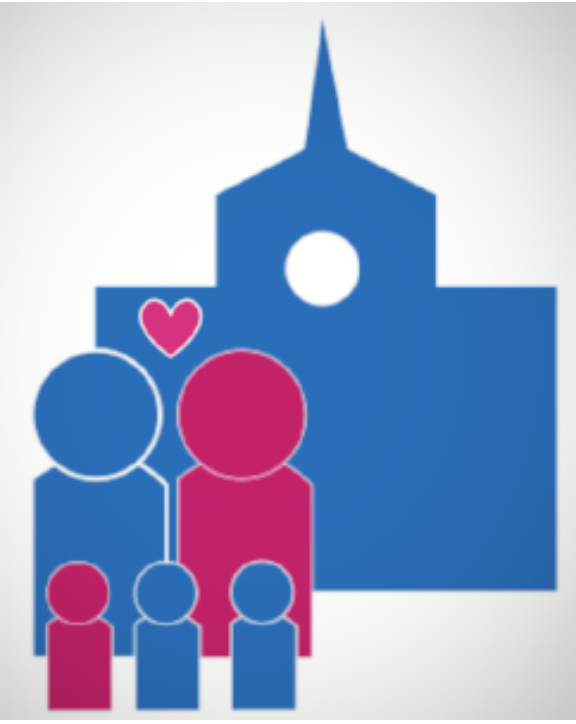 (From the MARRI collection of 5 thousand charts on family structure from the 1940’s to the present). From this we see a disturbing polarization outside of the Sunday Stalwarts (who have some balance on the issue). I would be among those who would say (with a major caveat) that it is not necessary to believe in God to have good values and to be moral. I have met many such people. My caveat: it is much easier to be moral and have good values if one practices believes in God enough to worship him in community. I don’t trust the ‘God and Country’ type nor the ‘Diversely Devout’ to build the bridges necessary for a functioning polis or political community, which at bottom is a discourse on political morality. 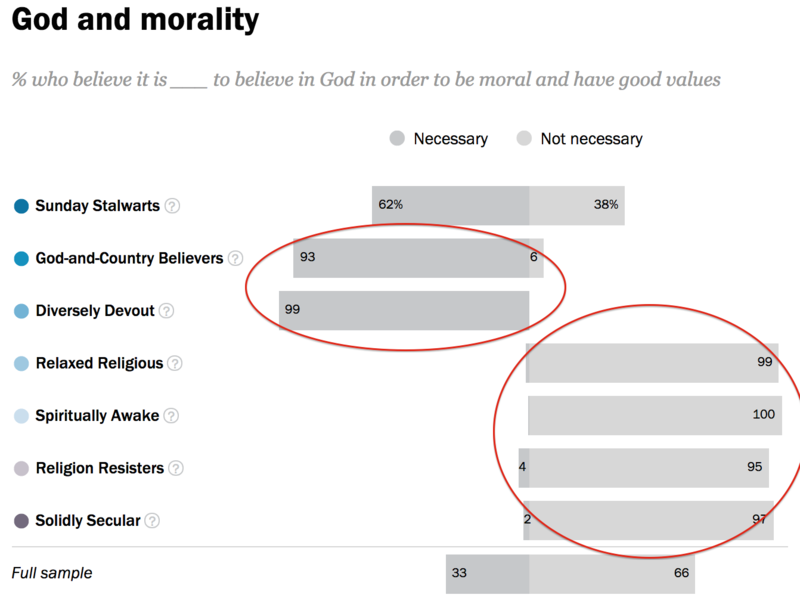 And clearly the remaining groups in the Typology see no contribution from religion to morality. Now that is dangerous! The more the Sunday Stalwarts shrink as a percent of the nation, the more polarized and the fewer bridge builders we will have, leaving more and more of the country polarized. Reason and philosophy will have no place in matters moral! “Researchers ultimately settled on the 16-question, seven-category cluster solution summarized in this report because it has several strengths. First, the solution divides respondents into a relatively small number of groups that are distinct from one another, large enough to permit statistical analysis, and substantively meaningful. 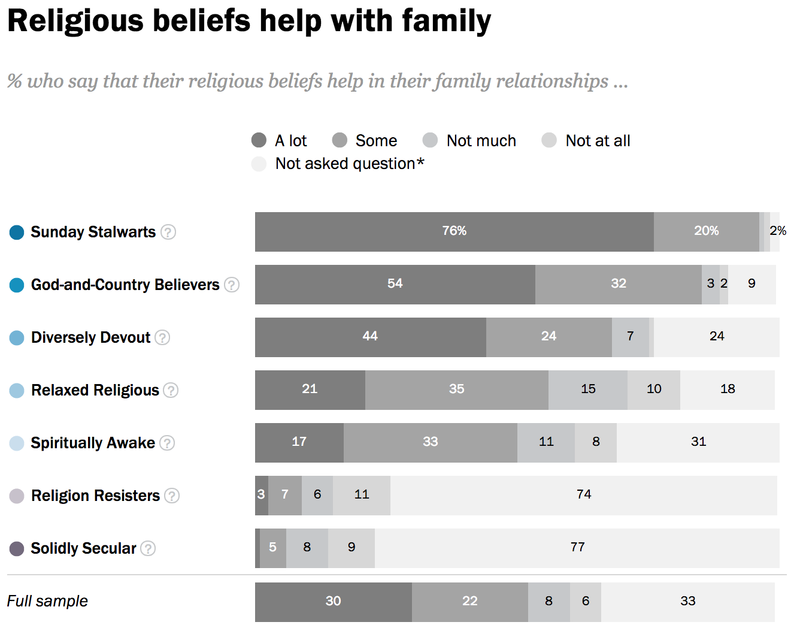 Second, all the survey questions that went into the algorithm are measures of religious or spiritual characteristics, making this truly a religious typology.”  [1-6] From the Report.